At Rockingham Turf we don’t want to only maintain your lawn. Our experienced turf professionals want to care for your entire property. 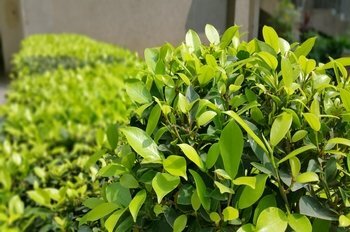 We offer extensive, effective tree and shrub care services to keep the large plantings throughout your residential and commercial yards healthy, strong, and thriving. Most home and business owners take a reactive approach to the trees and shrubs in the yards, only giving them attention when a limb falls, or a bush dies. At Rockingham Turf Care, we understand that it’s critical to proactively protect and preserve your yard’s plantings for a wide range of reasons. Neglected trees and shrubs can fall vulnerable insects as well as a wide range of diseases. We create a treatment plan to fight off any current health concerns for your plantings as well as develop a preventative plan moving forward to ward off future sicknesses and potentially devastating infestations. Simply put: maintained trees and shrubs just look better. Rockingham Turf’s customized treatments minimize weak limbs and eliminate deteriorating sections to improve your yard’s overall appearance. Healthy, thriving trees and shrubs can also enhance your property’s the overall value. We eliminate sickly and weak plantings to instantly boost your yard’s curb appeal to potential buyers. These three factors help us pinpoint issues that may hinder health and growth. From there, Rockingham Turf develops a personalized solution based on your property’s specific needs and deficiencies to help your landscapes thrive. Most importantly, at Rockingham Turf, we practice Integrated Pest Management (IPM). This means we only apply pesticides and fungicides when they are absolutely necessary to protect a tree plant or shrub from destruction. We explore every other viable option before we release a pesticide or fungicide into the environment. Whether you require routine applications, or occasional ad hoc treatments, Rockingham Turf Care’s customized services are designed to keep your trees and shrubs in the best health possible all year long.